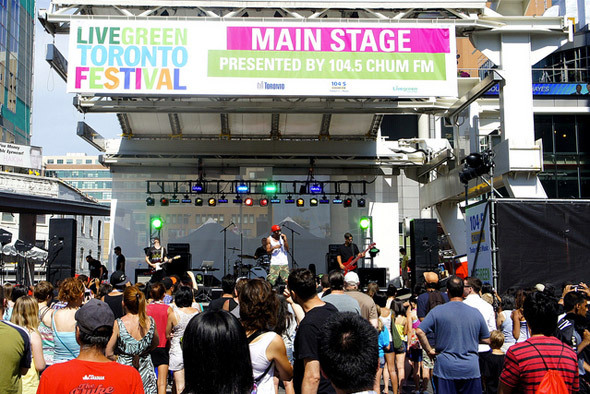 The Live Green Toronto Festival has grown in the seven years since its inception as the environmentally conscious lifestyle has moved from the fringe to the mainstream. 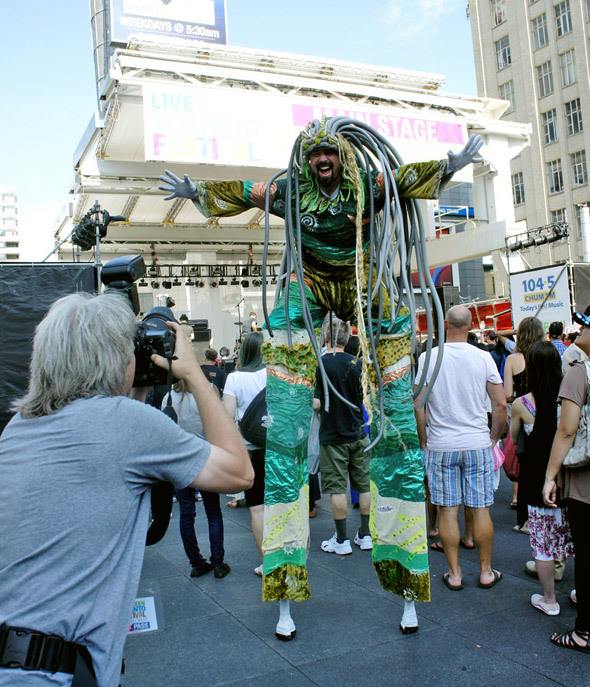 This past Saturday, Yonge Street and Yonge Dundas Square were packed with pedestrians exploring green products and services. Organizers wisely situated vendors solely on the west side of the street, easing congestion and preventing the whiplash that can result from trying to take in both sides of a festival corridor at once. 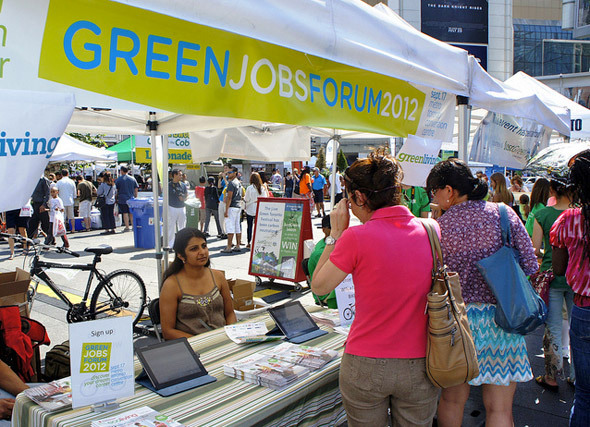 Vendors varied in green cred from totemic to tenuous. Mini-massage services, and ethnic arts and crafts were better suited to the Canadian National Exhibition. Fortunately, attendees were naturally drawn to such displays as the white electric car of Plug'n Drive Ontario, a not-for-profit coalition that aims to make Electric Vehicle (EV) infrastructure a reality in Ontario, and raise awareness of the benefits of EV. 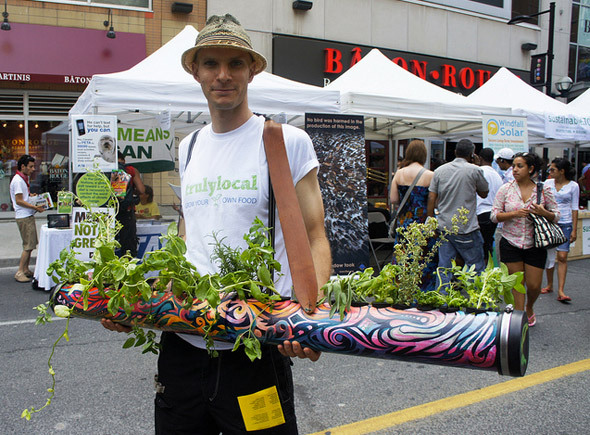 Equally eye catching was the colourful tube planter being toted by a member of Truly Local, a group of urban farmers who use innovative design to make vegetable gardening possible in any space. Without a visual gimmick, representatives of Inorganic Market actively engaged members of the public in conversations about the issue of electronic waste. Pedestrian-only Yonge Street - For the duration of the Festival, Yonge Street was closed to road traffic from Dundas to Queen, allowing pedestrians to walk freely without having to remain vigilant against cars and bicycles. This proved a mini-preview of more extensive changes to come later in the summer. 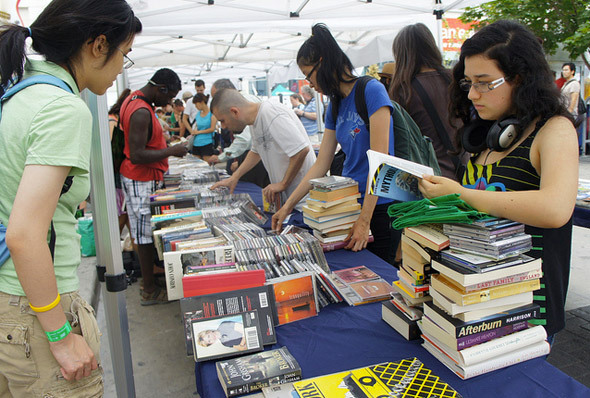 Swapsity's Swap Zone - This popular event returned to the Festival, giving attendees the opportunity to swap books, movies, and music from their personal stash for new pre-loved ones. 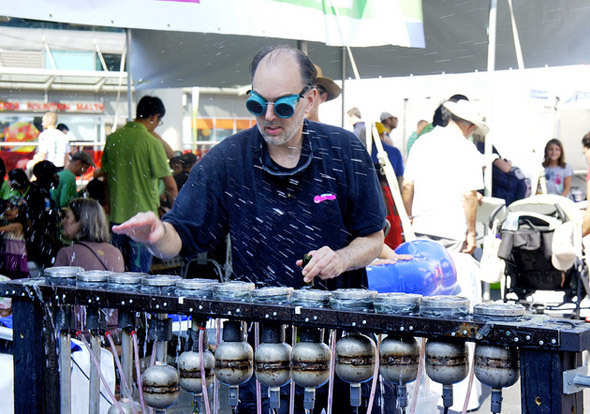 Funtain - In the midst of the chaos of Yonge Dundas Square, competing buskers and the Main Stage nearby, Steve Mann held a captive audience with his interactive water instrument. When Mann allowed members of the audience to give the instrument a try, in-between performances, both adults and children converged, eager to get their hands wet.